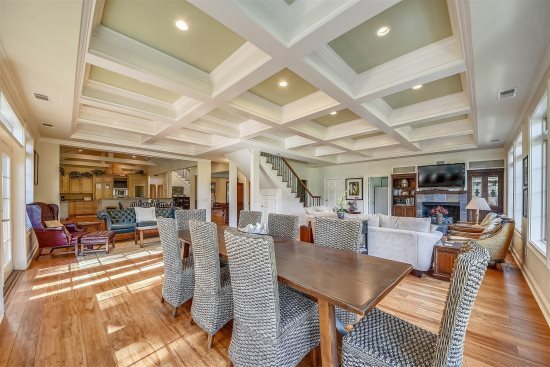 3 Bedroom/ 3 Bath Fairway Villa is located just mins from the Beach in Sea Pines Plantation! Offering just a few minutes walk to the Atlantic Ocean, 85 Fairway Lane makes a tranquil retreat with its soothing lagoon views and lush landscapes. You will hit relaxation mode the second you enter this 3 bedroom, 3 bathroom unit in the prestigious Sea Pines Plantation. 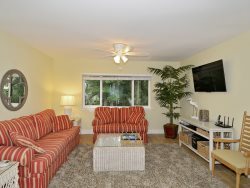 The visible golf course views can be seen upon entering the quaint and comfy living room area, decorated in blues and whites, and featuring two expansive couches and a sleek, flat screen television. Just off the living room is a nook with a glass top table and four wicker chairs with comfy cushions, the perfect spot to deal a hand of cards or sip your morning’s coffee while soaking up the lagoon views. There is also additional seating available in the sitting room where you will find a loveseat, two snug armchairs, and an ottoman. This room is ideal for catching up on your favorite novels or flipping through the pages of your preferred magazine. The chic dining room, has Spanish tiles throughout, a beautiful China collection on display, and has eight chairs. The functional, galley style kitchen with stainless steel appliances, sits just off the dining room and has all the fixings needed to create quick and easy vacation meals. For your laundry needs a stackable washer and dryer also sits next to the kitchen. Also on the first floor is one of the two master bedroom suites featuring a king bed, a flat screen television, and its own private bathroom with a walk-in shower. Up the stairs you will find the second master bedroom, delightfully decorated in bright colors with its king bed, flat screen television, and its own private bathroom with a walk-in shower. Adjacent to the master suite is the guests bedroom, perfect for kids and young adults with its twin beds charmingly decorated in bright oranges, reds, and greens, this room also has a flat screen television and its own bathroom. Everyone is bound to leave this piece of paradise feeling refreshed, renewed, and re-energized. 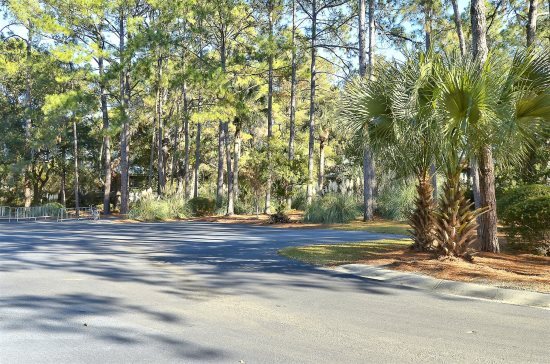 The beach path access is across the street from the complex and is approximately a 5 minute walk to the beach. This unit does not have access to its own pool but guests can pay and use the pool at the South Beach Racquet club for an additional cost. Sea Pines Plantation is Hilton Head Island's original and largest planned resort. While it is currently the home of the Heritage Golf Tournament, it is the abounding natural beauty that beckons one to return again and again. Five miles of white sandy beach offer swimming, sailing, parasailing, kayaking, and fishing. For the land lovers there are 14 miles of bike baths, 3 golf courses, tennis, and a broad range of shops and restaurants that will please every vacationer.